I love this image. The repeat-patterns...the rough lips of the macarons . The smoothness of her lips juxtaposed with the smoothness of the tops of the macarons. 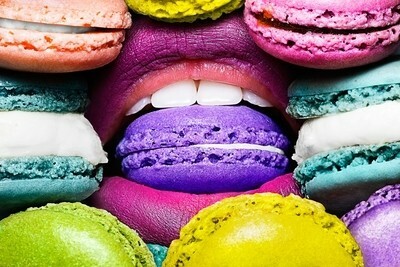 The repeat of the ‘white teeth’ in the filling of the Macarons...I can go on and on. I hope you had some Macarons after the shoot, Mine is definitely the pink ones with the delicate rose essence. Great image!